The tryptic Peptides from a cytochrome P450 enzyme show sequence specific association of with multiwalled carbon nanotubes by localization of hydrophobic residues around the nanotube. In the Biochemistry and Systems Biology and the Chemical Biology and Bioinorganic Chemistry groups, a model-free approach has been used to study the association of peptides onto multiwalled carbon nanotubes (MWCNT) in aqueous solution at ambient pH to understand the molecular basis of interaction of the peptides with MWCNT. 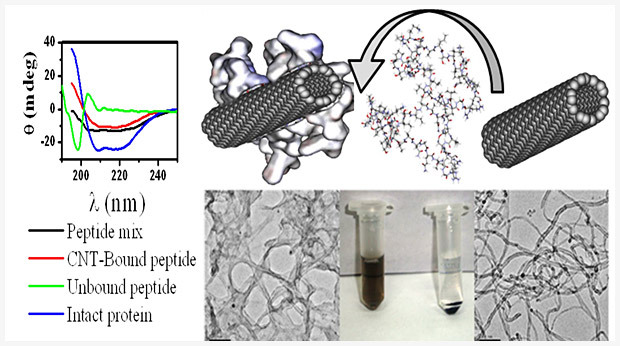 The peptides obtained by tryptic digestion of cytochrome P450cam from P. putida were allowed to interact with MWCNT and several peptides were found to bind to the nanotube leading to formation of stable homogeneous dispersion of the bio-nano conjugates of MWCNT. The peptides bound to the MWCNT were separated from the unbound peptides and sequence analyses by tandem MS/MS technique identified the strongly bound peptides as well as the unbound and the weakly bound peptides. The peptide-MWCNT conjugate was further characterized by TEM as well as Raman and other spectroscopy. The screening of the peptides bound onto MWCNT from a mixture of tryptic peptides of cytochrome P450cam provided a simple route for obtaining 12 peptide sequences that were strongly associated to the nanotubes. Cytochrome P450cam is chosen in the present study as it consists of a significant fraction of hydrophobic residues distributed all over the protein. However, one could apply similar approach to screen peptides from any large protein for binding to carbon nanotubes. A model based on the hydrophobicity of residues in the peptides suggested that the amphiphilic peptides with localised hydrophobic residues at the center or at one end of the sequence form stable dispersions of the peptide-MWCNT conjugates.